History and Painters of Brittany Artist Colony: Paul Gauguin.  What is the Pont-Aven School?  Who Were the Most Famous Painters that Worked at Pont-Aven?  What is the History of the Pont-Aven Artist Colony? For the evolution of painting, see: History of Art. For a chronological outline, see: History of Art Timeline. the main square at Pont-Aven. What is the Pont-Aven School? In modern art, the term "Pont-Aven School" describes the painting produced in the artists' colony at Pont-Aven, Brittany, France, which started to form in the 1860s and lasted until about the 1900s. It became an important forum for progressive French Painting during the 1880s and 1890s, when it was visited by several important Post-Impressionist painters, seeking to move beyond the imitation of nature promoted by Impressionism. Works by Pont-Aven artists were typically characterised by the bold handling of pure colour, a flat picture plane and a narrative containing elements of symbolism within a non-naturalist colour scheme. Except for the naturalist art produced by visiting Irish painters, Pont-Aven might arguably be regarded as a pioneering laboratory in the evolution of the European expressionism movement. For a wider view, see: History of Expressionism (1880s-1930). Who Were the Most Famous Painters that Worked at Pont-Aven? 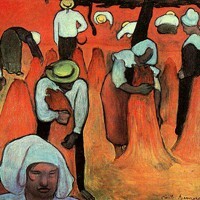 Famous painters associated with the Breton colony include Paul Gauguin (1848-1903), Emile Bernard (1868-1941), Louis Anquetin (1861-1932), Paul Serusier (1864-1927), the modernists Emile Schuffenecker (18511934), Jacob Meyer de Haan (1852-95), Charles Laval (1862-94), Charles Filiger (1863-1928) and Armand Seguin (1869-1903), as well as the important Irish artists Augustus Burke (18381891), Walter Osborne (18591903), Roderic O'Conor (18601940) and Nathaniel Hill (1861-1934) . Paul Gauguin, a leading contributor to progressive Post-Impressionism, painted at Pont-Aven on several occasions during the years 1886, 1888-9 and 1894, sometimes for extended periods. It was at the Pont-Aven artist colony, and at the neighbouring village of Le Pouldu (now part of Clohars-Carnoet), that he developed the decorative painting style of Synthetism, a new type of Post-Impressionist painting which featured areas of flat colour applied without shading or any attempt to create depth in the picture plane. Synthetism is exemplified by Gauguin's masterpiece Vision After the Sermon (1888, National Gallery of Scotland). Emile Bernard and Louis Anquetin collaborated with Gauguin in his invention of Synthetism, and developed their own slightly different version, known as Cloisonnism. This was characterized by large patches of vivid colour enclosed within thick black outlines, executed in the manner of medieval cloisonne enamel. The most obvious difference between these two styles of art is that Synthetism lacks the pronounced black outlines of cloisonnism. Followers of Gauguin at Pont-Aven, who adopted the two new styles, included Charles Laval, Emile Schuffenecker, Jacob Meyer de Haan, Wladyslaw Slewinski (18541918), Charles Filiger, and Armand Seguin. Another acolyte of Gauguin was Paul Serusier, who became the leader of the Nabis, a group of Parisian artists influenced by the aesthetics of Symbolism and fin de siecle decorative art. Other Nabis included: Maurice Denis (1870-1943) who also visited Pont-Aven - the group's leading theorist - Pierre Bonnard (18671947), and Edouard Vuillard (1868-1940). It was at Pont-Aven that Serusier composed his influential work The Talisman (1888, Musee d'Orsay, Paris). Irish artists who came to Pont-Aven and other villages in Brittany typically had a quite different agenda to Gauguin and his followers. Like the earlier American art students, Irish painters were - with certain exceptions like Roderic O'Conor - devoted to naturalism, and specialized in realistic, Barbizon-like landscape and genre painting. What is the History of the Pont-Aven Artist Colony? A commune located in the Department of Finistere, on the Atlantic coast of Brittany, Pont-Aven actually stands a few miles inland from the point where the River Aven meets the sea. With the expansion of the railways, during the 1860s - the first train from Paris to Quimper ran in 1862 - Parisian painters were able to spend their summers in the countryside or on the coast, where they practised plein-air painting on a reduced budget. The rugged scenery of Brittany as well as its unchanging customs, traditional dress and old Catholic churches, had attracted artists since the 1830s, and by the 1870s Pont-Aven had become a favourite location for the new wave of city artists, as well as Irish and American art students. The eminent French Academician Jean-Leon Gerome (1824-1904), for instance, encouraged all his American students to visit Brittany. Visitors to the colony during the 1860s included, among others: the German painter Otto Weber (18321888); the Americans Henry Bacon (18391912), Robert Wylie (18391877), Frederick Bridgman (18471928), and Earl Shinn (18381886); the French artists William Bouguereau (18251893) and Louis Cabat (18121893), and the Dutchman Herman van den Anker (18321883). During the 1870s and 80s, visiting painters included: the Frenchmen Paul Sebillot (18431918), Alexandre Defaux, (18261900); the Americans Thomas Hovenden, (18401895), J. Alden Weir (18521919), Frank C. Penfold (18491921), Henry Mosler (18411920), Arthur Wesley Dow (18571822) and the Irishmen Augustus Burke (18381891), Walter Osborne (18591903), Nathaniel Hill (1861-1934) and Stanhope Forbes (1857-1947); while the 90s saw the arrival of the Irish painters Roderic O'Conor (18601940), and Joseph M Kavanagh (1856-1918), the English landscape painter Robert Polhill Bevan, and the leading Swiss symbolist Cuno Amiet (18681961). Works by artists of the Pont-Aven School can be seen in several of the world's best art museums. 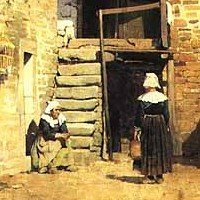 Here is a short selected list of paintings. 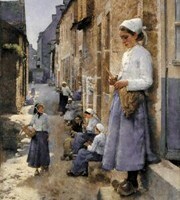 - A Street in Brittany (1881) by Stanhope Forbes. - Apple Gathering (1883) by Walter Osborne. - The Old Convent Gate, Dinan (1883) by Joseph M Kavanagh. - Breton Children in an Orchard (1883) by Stanhope Forbes. - Sunshine, Brittany (1884) by Nathaniel Hill. - The Talisman (1888) by Paul Serusier. - Breton Women in Meadow (Pardon de Pont-Aven) (1888) by Emile Bernard. - Vision After the Sermon (Jacob wrestling with the angel) (1888) by Gauguin. - La Jeune Bretonne (Young Breton Girl) (1895) by Roderic O'Conor. Home to the Barbizon School of Landscape Painting, this was a small village near the Fontainebleau forest, south of Paris. Leading members included Camille Corot, Theodore Rousseau, Jean-Francois Millet, Charles-Francois Daubigny and Narcisse Diaz de la Pena. The coastal village of Skagen in Northern Jutland, Denmark, was home to a thriving artist colony - a group known as the 'painters of light' - popularized by the Impressionism of Norwegian-born P.S. Kroyer (1851-1909) and the Danish interiors painter Vilhelm Hammershoi (1864-1916). Noted for its artist colony devoted to plein-airism and, later, abstract art, the St Ives School in Cornwall was home to the sculptors Ben Nicholson, his wife Barbara Hepworth, and the Russian Naum Gabo, as well as painters like Peter Lanyon, Terry Frost and Patrick Heron. The Cornish Newlyn School attracted artists looking to paint landscape scenes in a purer setting, with strong natural light. Members included Walter Langley, Edwin Harris, Stanhope Forbes and Frank Bramley. A north German village close to Bremen, whose artist colony flourished during the last decade of the 19th century. Famous members of the Worpswede colony included the pioneer of German Expressionism, the short-lived portrait artist Paula Modersohn-Becker (1876-1907).  For information about modern French painting, see: Homepage.